Because of the Affordable Care Act, more Arkansas residents have access to health insurance, which means the demand for qualified licensed practical nurses is steadily increasing. In addition, federal legislation has shifted the way health institutions deliver patient care, putting greater emphasis on prevention and chronic disease management, which also bumps up the need for highly skilled LPNs. The following guide explores the practical nursing field specifically in Arkansas. Those considering this career path will find information on state licensing requirements, earning potential, and employment opportunities in specific locations of the state. Nursing is a great career for anyone who wants to work with others and provide care to those in need, and a practical nursing program can offer a fast track to this type of work. State-approved programs can be found at community colleges and technical schools across Arkansas. Although there are several programs from which to choose, not all will be the best fit for every nursing student. The search tool below helps users filter through and compare options to find the LPN program that’s right for them. In order to legally work as an LPN, all professionals must obtain a license in their state of employment. Requirements for licensing differ from state to state. This section reviews what is required to obtain an LPN license specifically in Arkansas, as well as how to keep that license active. In order to work as a practical nurse, the Nurse Practice Act mandates that prospective LPNs be licensed by the Arkansas State Board of Nursing. To be eligible for licensure by examination, applicants must complete a Board-approved accredited practical nursing program. Certain exceptions may be made such as if an individual completed part of an RN program, graduated from an approved RN program and failed the NCLEX-RN exam, or graduated from a Board-approved LPTN program after March 18, 1980. In Arkansas, nurses are required to renew their licenses every two years. Renewal dates are based on the applicant’s year of birth. For example, those born in even-numbered years will have an even year expiration date and those born in odd-numbered years will have an odd-numbered year expiration date. In addition, the expiration date of licenses is always the last day of the applicant’s birth month and licenses must be renewed within the 60-day period before the expiration date. To renew an active license, LPNs must complete 15 contact hours of Continuing Education (CE) from a Board-approved provider. Individuals will be required to list all CE that has been fulfilled and also submit verification, such as copies of certificates, transcripts, or certification information. Licenses must be renewed by midnight. Licenses considered expired can be renewed online (provided it has been expired for less than five years); however, an additional five hours of CE will be required, as well as a $100 late fee (in addition to the regular renewal fee of $65). The job outlook and salaries of licensed practical nurses depend on where in the state they work. This section explores LPN job opportunities and salaries in Arkansas, as well as how these numbers measure up against national averages. According to a 2014 Health Professions Manpower report from the Arkansas Department of Health, the state’s 13,963 active LPNs accounted for 28 percent of Arkansas’s nursing population. 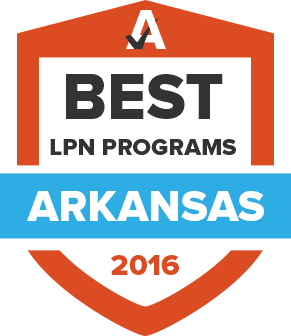 LPNs could be found in all regions across the state, with the largest concentrations in Northwest and Central Arkansas. Take a look at the data below for a closer look at the state’s practical nursing field. The local chapter of the American Psychiatric Nurses Association provides support for professionals who specialize in this area of the field. Psychiatric nurses in Arkansas can participate in forums and networking events, contribute to industry research, and affect policy that helps them perform their jobs. Nurse anesthetists in Arkansas can attend meetings and get news about the profession through this organization. In addition, the association provides scholarships and lobbies on behalf of nurses. This organization educates the state’s LPNs on the news that affects their work, such as Arkansas nursing legislation. In addition, the Arkansas Licensed Practical Nurses’ Association organizes events to help educate the workforce. The Arkansas Nurses Association is the voice for nursing professionals in the state. The organization promotes professional development through continuing education and events that allow nurses to learn and connect with each other. In addition, the association provides advocacy support to ensure that the needs of nurses are being met. The Arkansas Nurse Practitioner Association promotes excellence among nurse practitioners. The organization provides a career center, professional events, and news about the field. This is the Arkansas chapter of the National Student Nurses Association. The organization supports the needs of nursing students by providing resources to help them succeed in school, as well as thrive in their future careers. The Arkansas chapter of the National Association of School Nurses helps to promote the wellness of schoolchildren by advocating for quality nurse training. Members can receive news about the industry, participate in events, and get job leads. Nurses in Arkansas receive their licenses through the Arkansas State Board of Nursing. In addition to issuing licenses, this agency is responsible for approving education programs and enforcing state rules that nursing professionals must adhere to. This data, which was compiled by the Arkansas State Board of Nursing, includes the NCLEX pass rates for LPN programs around Arkansas from 2011 to 2015. This site lists practical nursing programs that are approved by the Arkansas State Board of Nursing.